← Who owns your content? Just as we crossed into the month of June last night, we signed up our 2,000th registered author! It appears the word about Protagonize has been spreading a little faster of late. It feels like I just watched the site hit 1,500 authors (and I did, only 3 weeks ago); prior to that, we hit 1,000 members in April. In the last few months, Protagonize’s popularity has been growing steadily, and I’ve watched our community’s growth (and growing pains) as we’ve all adapted to working together in this collaborative environment. I’ve gotten some excellent suggestions and feedback from both new members and from folks who have been with us since the get-go, and I’ve made changes to the site to support our expanding membership. This entry was posted in Collaborative writing, Features, General, Site updates and tagged 2000, authors, community, membership, milestones, protagonize, registered. Bookmark the permalink. 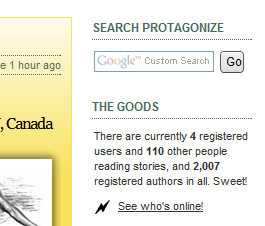 2 Responses to Protagonize reaches 2,000 author plateau!